The Mondavis are often compared (accurately) to the Kennedys, whose dramatic triumphs are matched only by the crushing blows they have withstood over generations. 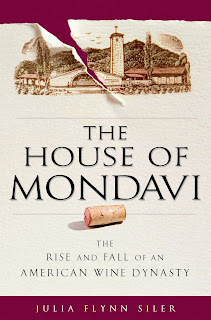 Julia Flynn Siler, a writer for the Wall Street Journal has chronicled the over 100 year history of the "First Family of American Wine" in her new book The House of Mondavi: The Rise and Fall of an American Wine Dynasty (Gotham Books). M&LAF was lucky enough to interview Ms. Siler about her work and the complicated legacy of the Mondavis. world stage as a great winemaking dynasty or are they considered second-tier because they are American winemakers? JFS: Until perhaps the last decade, American wine makers were overshadowed by the French, with their long and grand tradition of winemaking. Yet two watershed moments helped change that perception – and both involved the Robert Mondavi Winery. The first was the famous “Judgment of Paris” in 1976, in which French judges, after a blind tasting of first growth wines versus those from California, chose California wines produced by two former winemakers for Robert Mondavi – Warren Winiarski and Mike Grgich – as the best. The second key moment in American winemaking’s coming-of-age was the celebrated joint venture between the Robert Mondavi Winery and France’s Baron Philippe de Rothschild, a producer of Gran Cru wines from Chateau Mouton-Rothschild in Bordeaux. The Bordeaux-style wine they jointly produced, which came to be known as Opus One, was announced in 1980, and the Robert Mondavi Winery was the first American winery to forge such a prestigious partnership with a premier cru, or first class, winery. to the forefront of American winemaking? JFS: Yes, the partnership with the Rothschilds was key in terms of raising the quality levels of the wines produced by the Mondavis to a new level, including transferring such techniques from the French as high density planting of vineyards, thereby forcing the plants to compete more vigorously for soil, sun and water. Together, Robert and his younger brother Peter Mondavi, while working together at Charles Krug in the 1950s and 1960s, were early adopters of such then-novel ideas to the American wine industry as oak barrel fermentation and wine-tasting on the grounds of the winery. Mondavi dynasty might have avoided some of its recent misfortune-Do you think the family thought they could avoid fate or did they simply misread (or ignore) the writing on the wall? JFS: Hindsight is always 20-20, but several family member and close advisors to the Mondavis told me in the course of my reporting that they’d wished they’d never taken the family business public in 1993 in the first place. In the decade after they sold stock in the Robert Mondavi Corp. to the public through NASDAQ, the world changed very dramatically for publicly-traded companies, in large part because of the 2002 Sarbanes Oxley Act, which became law in the wake of the scandals at such companies as Tyco and Enron and required much greater levels of public disclosure. Although the Mondavi family and its advisors, at the time of its IPO, had felt that the company was virtually “takeover proof” because of the dual share structure they put into place which vested the vast majority of voting control with the family, in fact, it was not.